Luzon, Philippines. 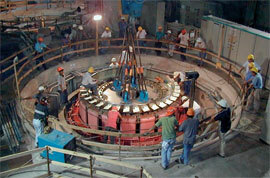 Operations for the installation of the generator in the underground power plant. Our business is to anticipate and meet the demands of our customers through reliability, versatility and high skills assuring them more than a century of professionalism built on our commitment. The constant innovation and technological research have allowed us to develop different skills in various areas of business activity: Infrastructure, Construction, Real Estate and Precast bringing Pizzarotti Group among the first operators in Italy and abroad in the construction industry. We pay particular attention to the development of human resources, through customized training projects with the aim of enhancing customer satisfaction and start new business areas. Reliability: our company policy focuses on the needs of our customers, and transparency in the interaction with financial operators, local authorities and employees. We provide our stakeholders with over a century of expertise built on our reliability and our committent. Versatility: our intent to share our Clients’ needs has led, over the years, to the acquisition of diversified expertise in the various areas of infrastructure and construction sectors, with special dedication and care for technical and quality aspects, while respecting and safeguarding environment, health and safety in the workplace. Excellence: we always pay great attention to quality in terms of optimization of production and organizational processes as a lever able to connect the various business sectors together with established relationships with national and international financial institutions, which allows us to be in the lead, both technologically and financially. The Pizzarotti Group has grown thanks to the daily commitment of our employees, to which we dedicate special attention through development training programs to improve knowledge, skills and behavior to enhance innovation approach and project effectiveness.